This delectably delightful purse features original vintage pinup and classic cartoon inspired artwork by Miss Fluff (Claudette Barjoud). The design is in soft candy colors with whimsical cupcakes sporting long, luscious lashes, and cute pinup dolls lounging amidst the cupcakes in a magical, sugar sparkly world! It is cupcakes galore for the cupcake crazy gal! The material is sumptuous vegan friendly, faux leather. It is the perfect size carry all, not too big, not too small, just right! The straps are nice and soft and it has a zippered closure, so you do not have to worry about your things flying out of it as you buzz about town! The zipper pull is an ultra cute, silver Fluff cupcake charm topped with a sparkly pink crystal. The interior lining is gorgeous black satin signature Fluff print. There is a zippered pocket on one side and two open pockets on the other side for your phone and other essentials you may need quick access to. 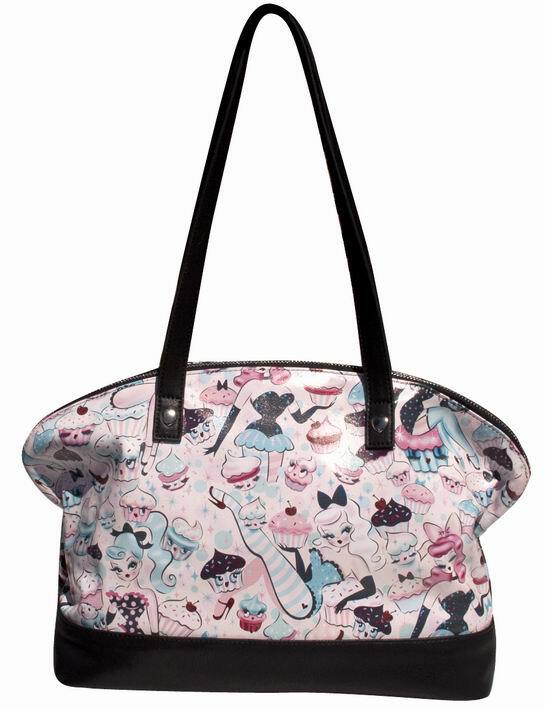 The Cupcake Dolls tote make make other gals swoon as you walk by so proceed with caution!